After a little trial and error I found that 3 45º strokes with my block plane, followed by a 22.5º either side of that created a very close round over, which is completed with a little light sanding. 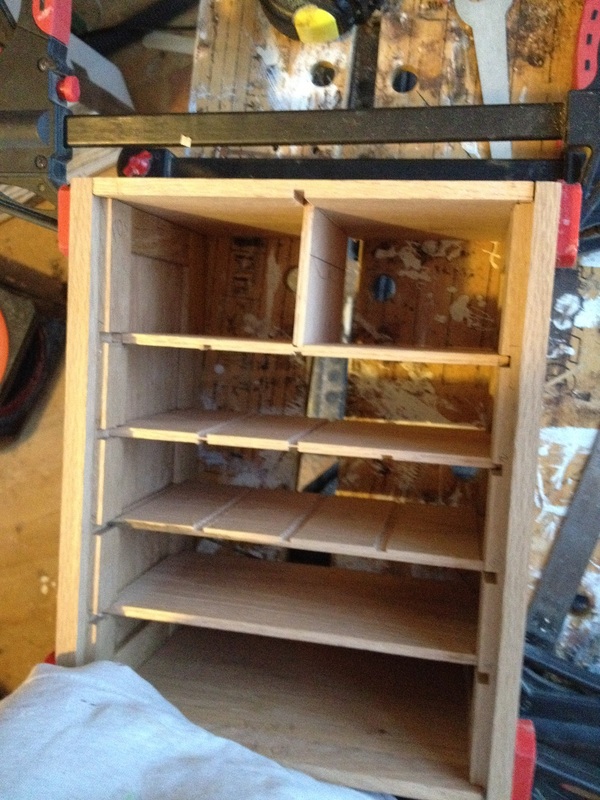 Once the shelves are ready, I positioned them in the cabinet for a dry fit. I drew where the dadoes meet the shelves which give me a start line to mark out where the dividers go. To make sure I get the dadoes in the right places, I used the layout marks from the dadoes and a compass to find the center of the board. I think this must be one of the first times I’ve used a compass for something other than drawing a circle. The layout lines were then used as a reference point to make sure my router was in the right place to cut the dadoes. 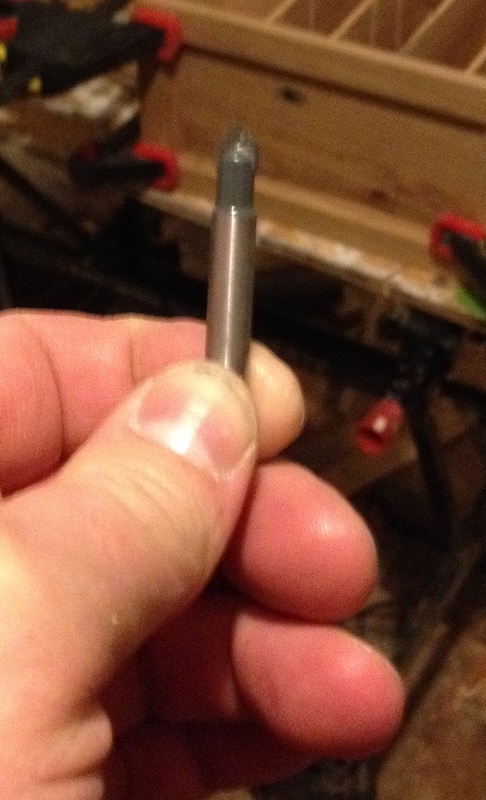 A 1/4″ v-groove bit has a sharp point and can help position the router on the line so the fence can be zeroed in. Swap the v-groove bit for the 1/4″ straight bit to make the cut and the dadoes are perfectly down the middle of the board. 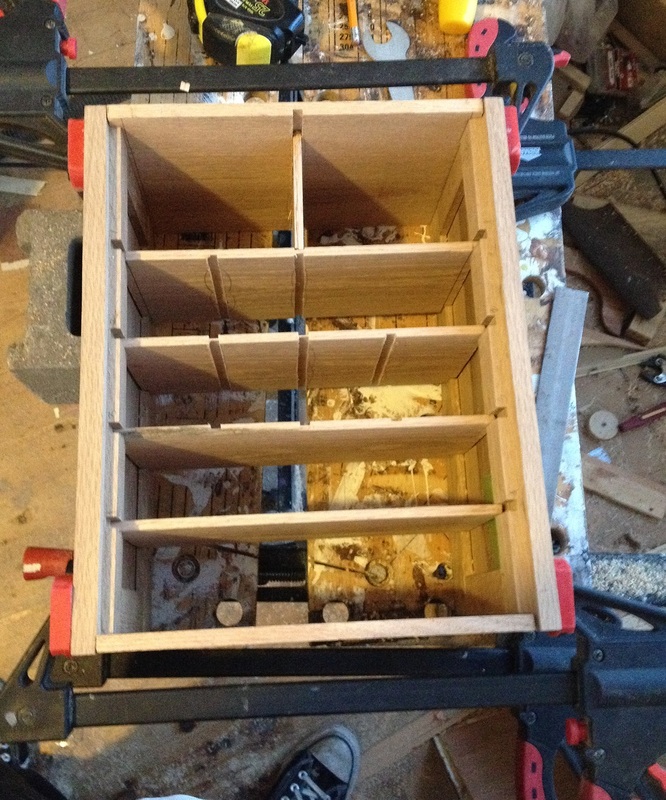 The depth of cut can be determined by dropping the router bit onto the workpiece whilst the motor is off, then placing an appropriate diameter drill bit in the depth stop. I did a couple of test cuts and worked out the best depth. After doing a couple of cuts things when a little wrong. I didn’t realise and cut one of the shelves in half. I didn’t realise until after I’d finished the second cut because of all the dust in the channel. Luckily I had enough stock prepared and was pleasantly surprised at how fast I was able to get a new shelf ready. 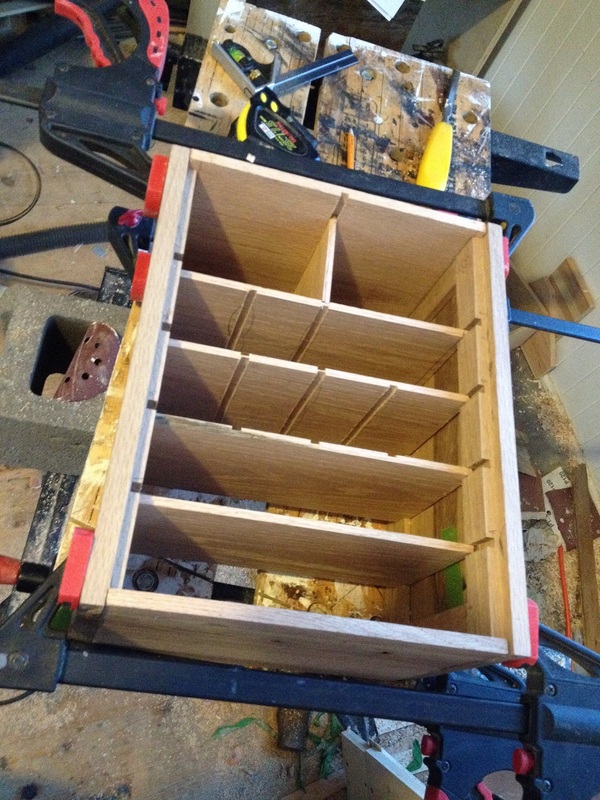 As I was finishing up, I managed to get one divider cut and placed in the dry assembly. At some point I managed to knock my tray of 200 odd drill bits on the floor. With all the dust and the incredibly small diameter bits, it was quite difficult to get them all. Until I remembered I had a super strong magnet from inside a dead hard drive, and used it to sweep the debris to pick up the drill bits.